Born in Hanoi in 1985. 2007: Bachelor, Hanoi University of Sciences, Vietnam. 2009: Master, Université Pierre et Marie Curie (Paris VI), France. 2013: PhD, Université Pierre et Marie Curie (Paris VI), France. 2013-2015 : Postdoc, Tel Aviv University, Israel. 2015-2017: Postdoc, Université Paul Sabatier (Toulouse 3), France. 2018-present: Institute of Mathematics, Vietnam Academy of Sciences and Technology, Vietnam. Research areas: Sharp version of functional and geometric inequalities, convexity in functional analysis and probability, optimal transportation of measures and applications. 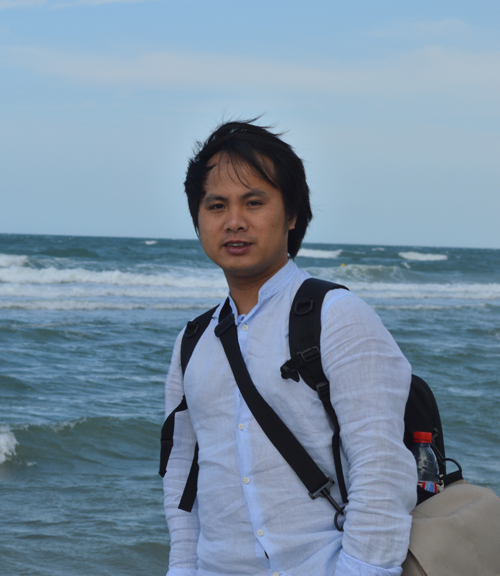 1 Nguyen Van Hoang, A simple proof of the Moment-Entropy inequalities", Advances in Applied Mathematics 108 (2019) 31-44, SCI-(E), Scopus. 2 Ngô Quốc Anh, Nguyen Van Hoang, Phan Quốc Hưng, A pointwise inequality for a biharmonic equation with negative exponent and related problems, Nonlinearity, 31 (2018), 5484-5499, SCI(-E); Scopus. 3 Nguyen Van Hoang, Orlicz-Lorentz centroid bodies. Advances in Applied Mathematics. 92(2018), 99–121,SCI(-E); Scopus. 4 Nguyen Van Hoang, Improved Moser–Trudinger inequality of Tintarev type in dimension n and the existence of its extremal functions. Annals of Global Analysis and Geometry, 54 (2018), 237–256, SCI(-E); Scopus. 5 Nguyen Van Hoang, Futoshi Takahashi, On a weighted Trudinger-Moser type inequality on the whole space and related maximizing problem. Differential and Integral Equations, 31 (2018), 785–806., SCI(-E); Scopus. 6 Nguyen Van Hoang, The sharp Poincaré-Sobolev type inequalities in the hyperbolic spaces H^n. Journal of Mathematical Analysis and Applications. 462 (2018), 1570–1584, SCI(-E); Scopus. 7 Nguyen Van Hoang, Improved Moser-Trudinger type inequalities in the hyperbolic space H^n. Nonlinear Analysis, 168 (2018), 67–80, SCI(-E); Scopus. 8 Nguyen Van Hoang, Maximizers for the variational problems associated with Sobolev type inequalities under constraints. Mathematische Annalen, 372 (2018), no. 1-2, 229–255, SCI(-E); Scopus. 9 Nguyen Van Hoang, Ngo Quoc Anh, Sharp reversed Hardy-Littlewood-Sobolev inequality on R^n. Israel Journal of Mathematics ,220 (2017), pp 189–223, SCI(-E); Scopus. 10 Nguyen Van Hoang, Improved Moser-Trudinger inequality for functions with mean value zero in R^n and its extremal functions. Nonlinear Analysis, 163 (2017), 127–145, SCI(-E); Scopus. 11 Nguyen Van Hoang, Improved Moser-Trudinger inequality for functions with mean value zero in \mathbb R^n and its extremal functions, Nonlinear Analysis, 163 (2017) 127-145. 12 Ngo Quoc Anh, Nguyen Van Hoang, Sharp reversed Hardy-Littlewood-Sobolev inequality on the half space R^n_+. International Mathematics Research Notices IMRN 2017, 6187–6230, SCI(-E); Scopus. 13 Nguyen Van Hoang, Some trace Hardy type inequalities and trace Hardy-Sobolev-Maz'ya type inequalities. Journal of Functional Analysis, 270 (2016), 4117–4151, SCI(-E); Scopus. 14 Nguyen Van Hoang, New approach to the affine Pólya-Szegö principle and the stability version of the affine Sobolev inequality. Advances in Mathematics 302 (2016), 1080–1110, SCI(-E); Scopus. 15 Nguyen Van Hoang, Improved Lp-mixed volume inequality for convex bodies. Journal of Mathematical Analysis and Applications, 431 (2015), 1045–1053, SCI(-E); Scopus. 16 Nguyen Van Hoang, Sharp weighted Sobolev and Gagliardo-Nirenberg inequalities on half-spaces via mass transport and consequences. Proceedings of the London Mathematical Society (3) 111(2015), 127–148, SCI(-E); Scopus. 17 Nguyen Van Hoang, Dimensional variance inequalities of Brascamp-Lieb type and a local approach to dimensional Prékopa's theorem. Journal of Functional Analysis, 266 (2014), 931–955, SCI(-E); Scopus. 18 Nguyen Van Hoang, A local proof of the dimensional Prékopa's theorem. Journal of Mathematical Analysis and Applications 419 (2014), 20–27, SCI(-E); Scopus. 19 Nguyen Van Hoang, Keith Ball, Entropy jumps for isotropic log-concave random vectors and spectral gap. Studia Mathematica, 213 (2012), 81–96, SCI(-E); Scopus. 20 Ha Huy Bang, Nguyen Van Hoang, and V. N. Huy, Some properties of Orlicz-Lorentz spaces, Acta Mathematica Vietnamica 36 (2011), 145 -- 167, Scopus. 21 Ha Huy Bang, Nguyen Van Hoang, and V. N. Huy, Best constants for the inequalities between equiavalent norms in Orlicz spaces, Bulletin of the Polish Academy of Sciences, Mathematics 59 (2011), 165 -- 174.